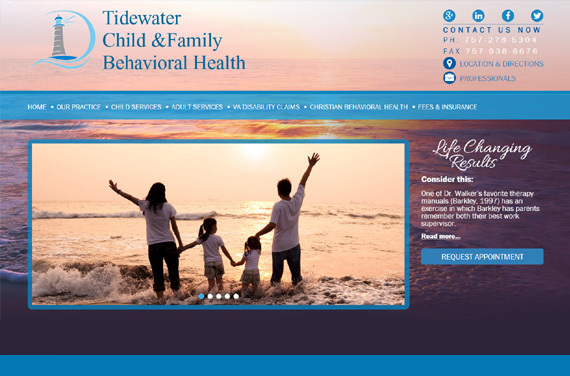 Website design for mental healthcare providers VA Beach | When Tidewater Child and Family Behavioral Health was looking for a Virginia based website design company they choose VISIONEFX to design their new website. They required a clean website design that was also mobile ready for hand-held devices, tablets, laptops as well as desktop computers. The website features pastel colors and design in Photoshop. The challenge was to create visual concepts that visually represented the wide range of healthcare services. When searching Website designers Va Beach – look no further than the web design experts at VISIONEFX. VISIONEFX, a Web design company based in Virginia Beach, VA provides services to national companies as well as small to medium businesses throughout the United States to include; custom web design, web development, E-commerce web design, Word Press web design, Joomla web development, Moodle, Custom database platforms, SEO and web maintenance services. Call: (757) 619-6456 or email info@visionefx.net.